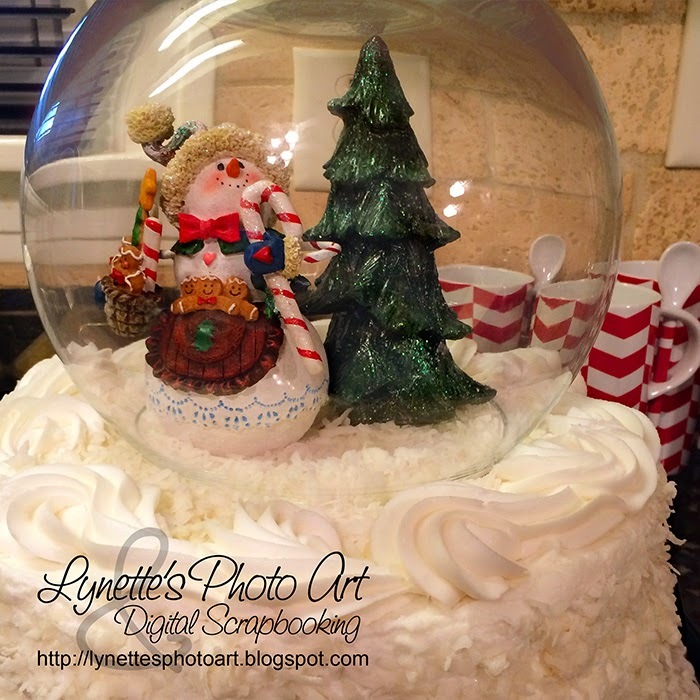 I fell in love with the idea of a snow globe cake when I first saw one on line. I've been waiting for an opportunity to make one ever since and Christmas was it! 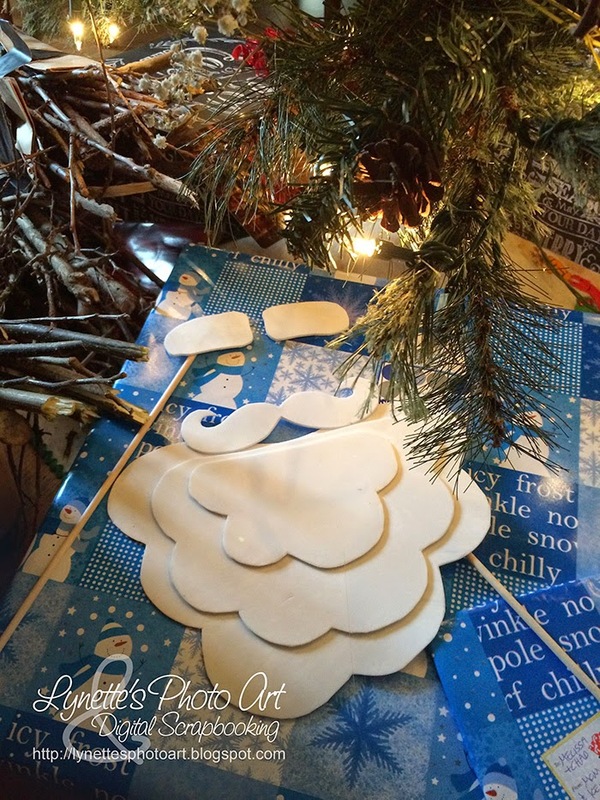 Gorgeous and magical and so easy! People are so creative! Merry Christmas! 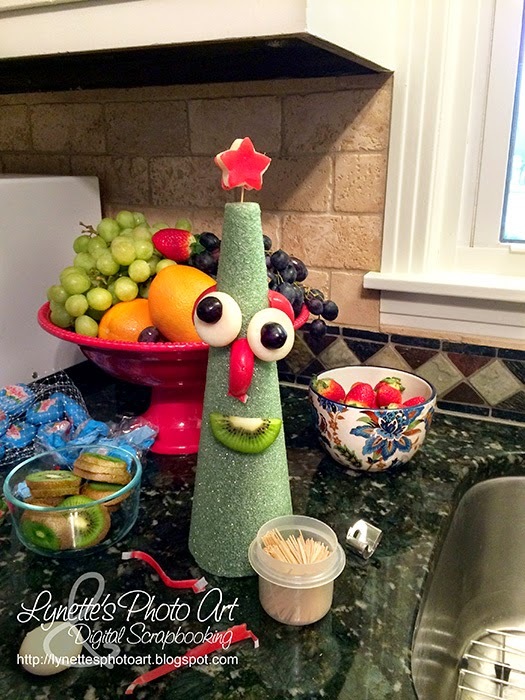 Larry The Cucumber Dressed Up As Carmen Miranda Came For Christmas! This was so much fun! We celebrated Christmas yesterday as that's when my daughters and new son-in-law were able to be here. 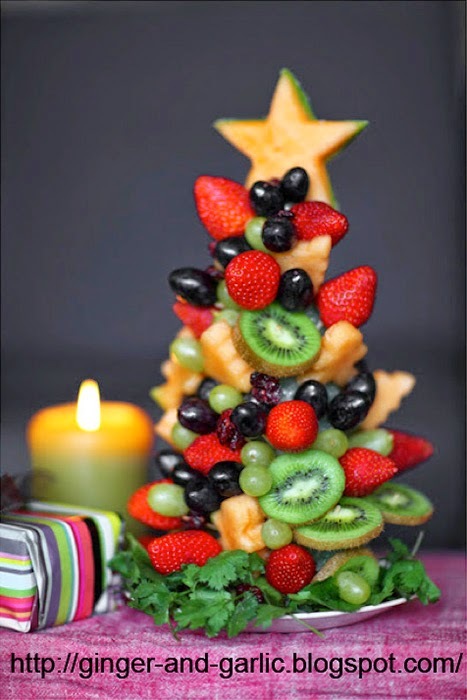 Bridey suggested it might be fun to have a project for them all to do together, so, when I saw this gorgeous fruit Christmas tree at Ginger & Garlic, I knew that was our project! I have been dreamily picturing this beauty being a stunning centerpiece and everyone eating it at Christmas dinner. Sigh! Apparently there was no "pressure" to feel as they dove right in without missing a beat! 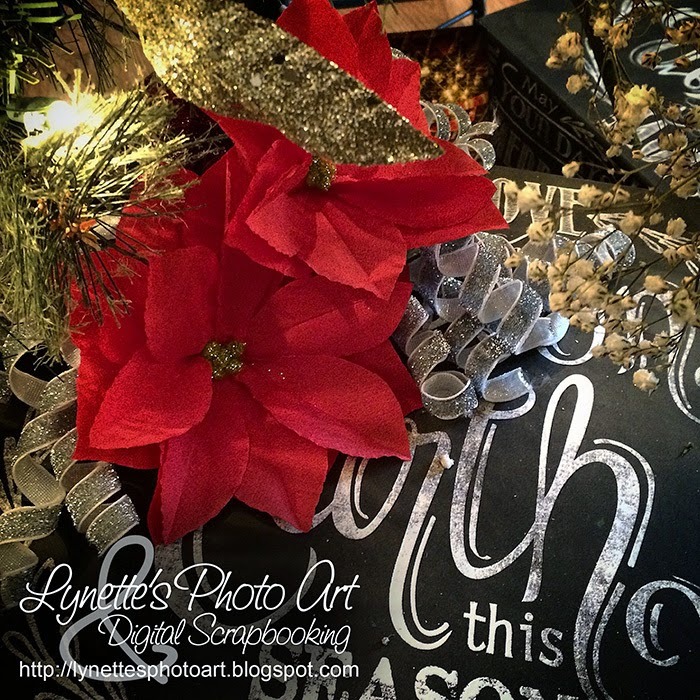 I never dreamed my creative and awesome daughters and new son-in-law would do what they did! It was so fun watching Larry the Cucumber (from Vegetales) come to life! There's a bit of Beaker (from the Muppets) in him too! I loved him when he was just a face wearing a star, but they kept going until he was all dressed up as Carmen Miranda coming to join us for Christmas dinner! Gotta love it! My oldest daughter made these amazing appetizers that became the bottom row on Carmen's skirt. 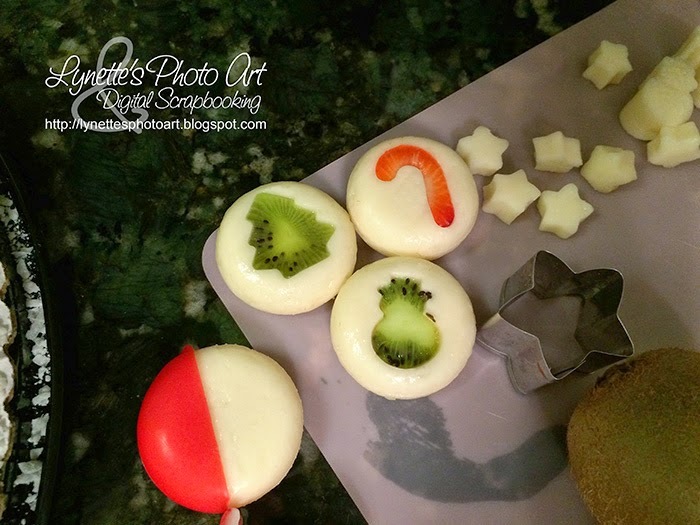 She used tiny cookie cutters on the cheese and fruit, then "inlaid" the fruit! Stunning! It is like stained glass when held up to light! I've never seen anything like it! Genius! A tray of those would be lovely too! Here "he" is on the table before the rest of the food. Who can look at this table and not smile?? Never thought I'd have Larry the Cucumber at my Christmas dinner! I can just hear one of my favorite Vegetale songs ... join me??? 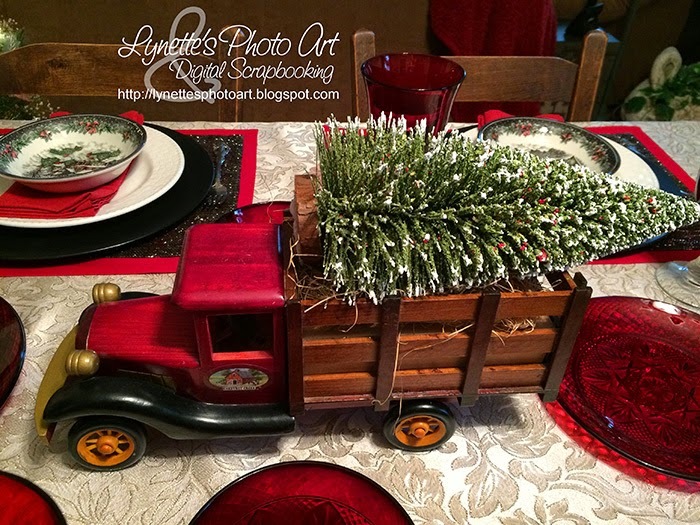 As to the rest of the table, my husband has been loving his wooden truck as the centerpiece this year. I got it on a day after Christmas sale at Walmart years ago for nearly nothing. It had food in it as a seasonal gift. It's really beautiful. The wheels even work! I added the bristle brush tree for the table this year. Yeah! It's always a plus when your husband is excited about the table! 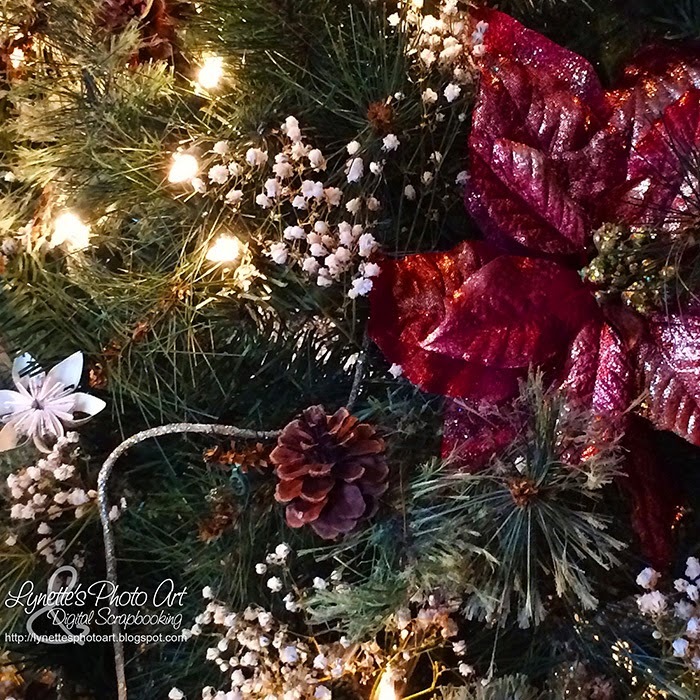 It went with the "feel" of the tree this year - Bridy's dried baby's breath from the wedding, sticks from the yard turned into casual stars, white paper snowflakes and such. It's a very homey, comfortable and warm tree this year and the truck is perfect for it! For the rest of the table, I used our much loved chalkboard chargers (made from $1.99 chargers), which we each customized with chalk at dinner. 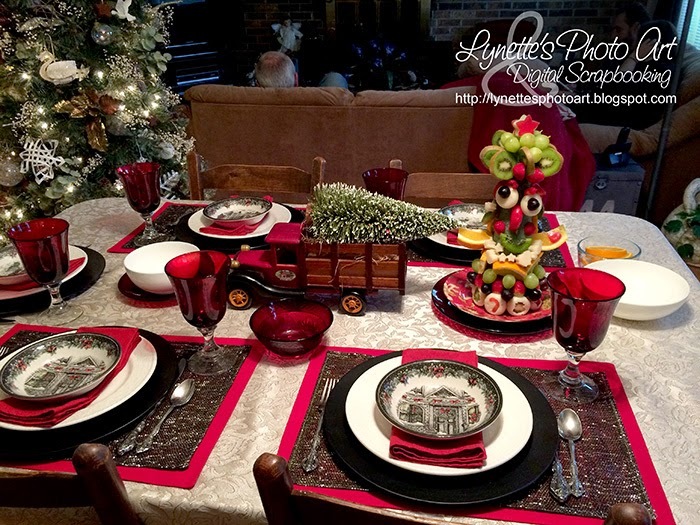 The red napkins (12 for $14.99) and placemats (4 for $9.99), sparkly woven place mats (4 for $5), white serving bowls ($3.99 each) and Christmas bowls ($3.99 each) on the napkins are all from Home Goods, a very happy place indeed! 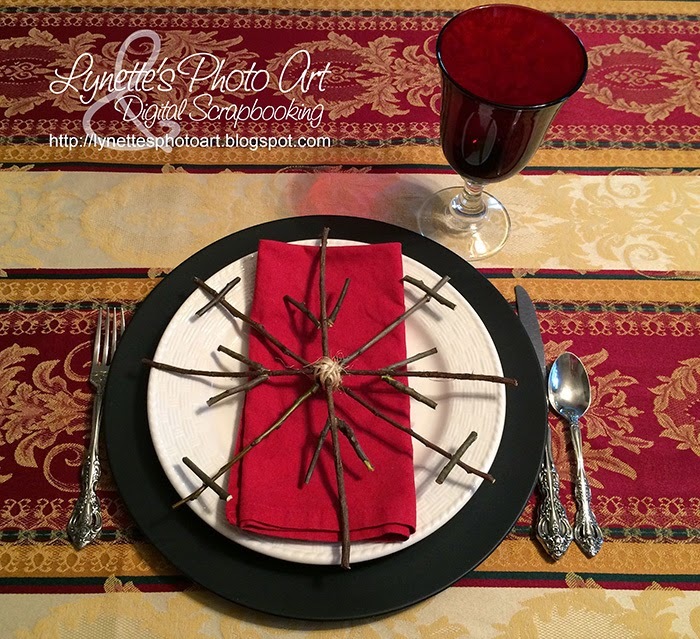 The gorgeous red goblets ($2.99 each) and other red dishes were from Walmart years ago - best find there EVER! The flatware is Oneida's Michelangelo ($12 per 5 pc. setting at outlet long ago). I'd have rather had a plain off white tablecloth, but this one is very old and paid for! 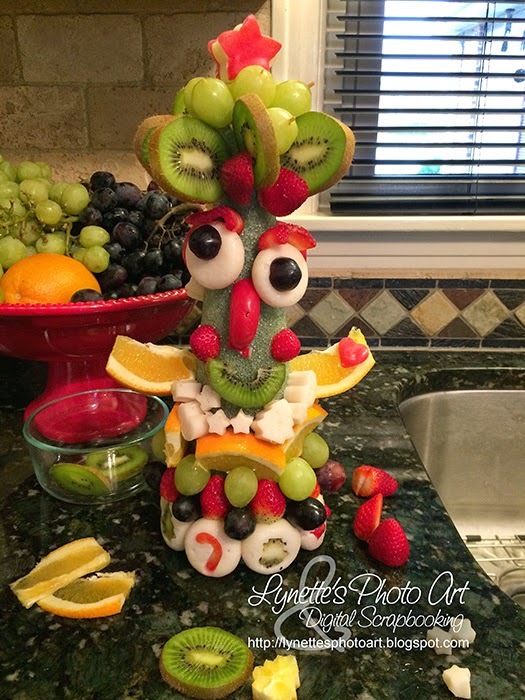 So, that's the story of Carmen Miranda aka Larry The Cucumber joining us for Christmas dinner! Hope you enjoyed it! Thanks for dropping by and I hope you have a fantastic Christmas too! 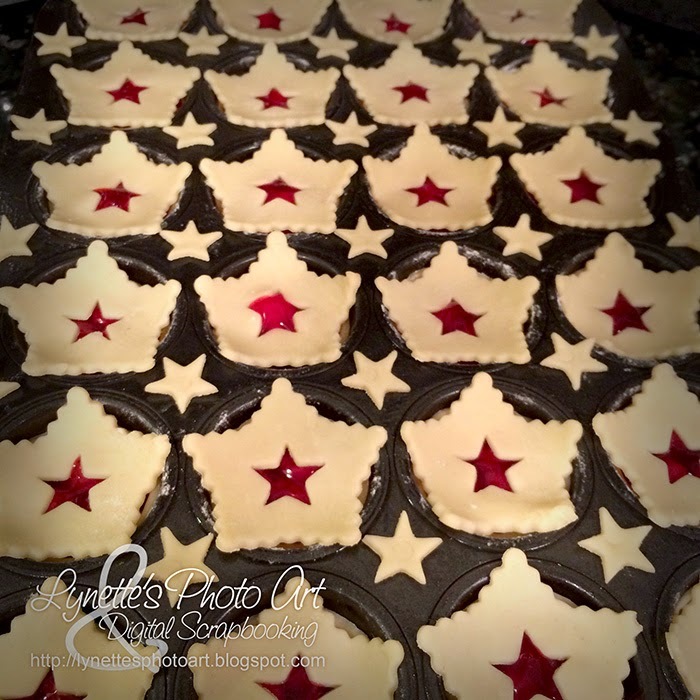 Mini-Cherry Pies and Boo's Merry Christmas! We celebrate tomorrow as both my daughters and my new son-in-law will be here. I'm SO blessed! I think I might be done making goodies now. This morning I made mini-cherry pies, with a twist. 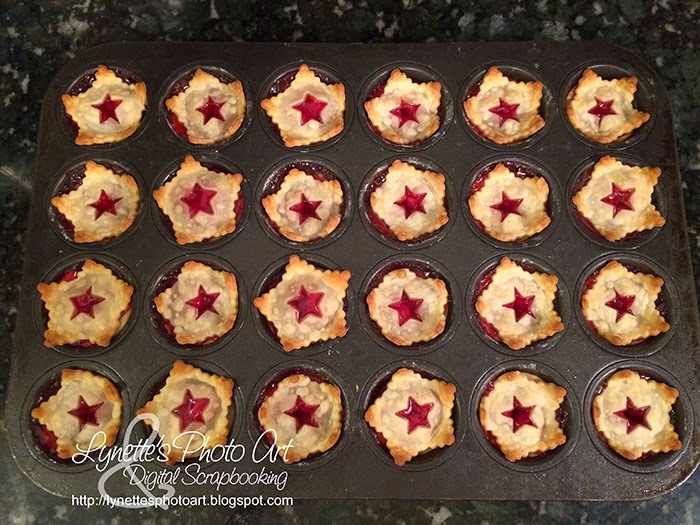 I made them in a mini-muffin pan and used my Lindzer cutter to make gorgeous tops to the pies! Aren't they awesome? Last night I noticed Boo just sitting on the back of the sofa (on Daddy's shoulder), staring intently at the Christmas tree. So precious! 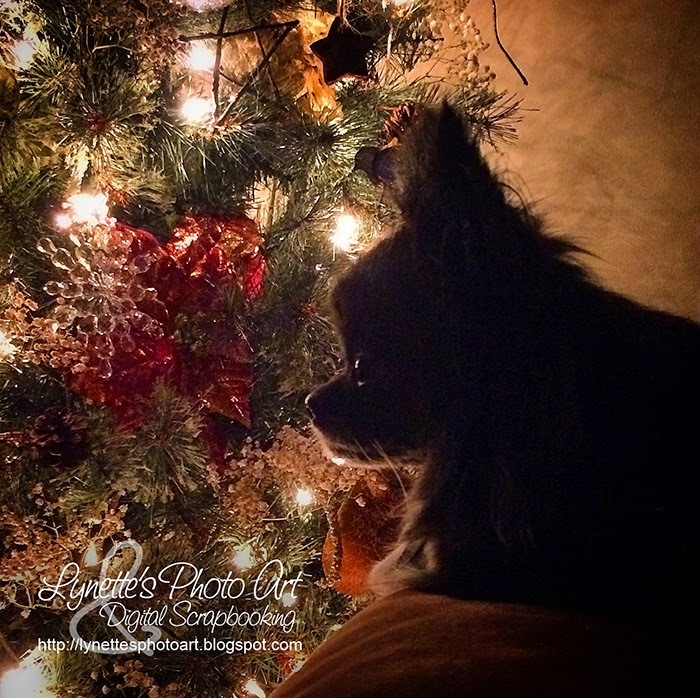 So this is my Merry Christmas to you from Boo, Daddy & I. I am so grateful that you spend some time here with me. Thank you so much! May God bless you and your loved ones in the most important ways and may you honor Him this holiday as well as every day, because He deserves it! Thank you Lord Jesus for being willing to come to earth, put on flesh as the creation, live a sinless life and teach us that the only way to heaven is through You. Thank You for giving Your life in place of ours to redeem us from an eternity in hell. Thank You so much for conquering death by rising from the dead, giving us the gift of the Holy Spirit to comfort and guide us and for preparing a place for us to spend eternity with You! Thank You Lord Jesus that you are coming again soon to take us home to be with you forever! All honor, power and glory be to You Father God! Thy will be done! Come Lord Jesus, come! This will be such fun! My daughter and her fiance wanted a photo booth at their wedding mid-October. I made a lot of props for it. My guidelines weren't very clear and this Santa set I made didn't end up being used. I was just cleaning and ran across it and a light-bulb went off! She and her new husband like photo booth things...this will be our first Christmas together...I have a great Santa hat that was my dear Mother's that would complete this... 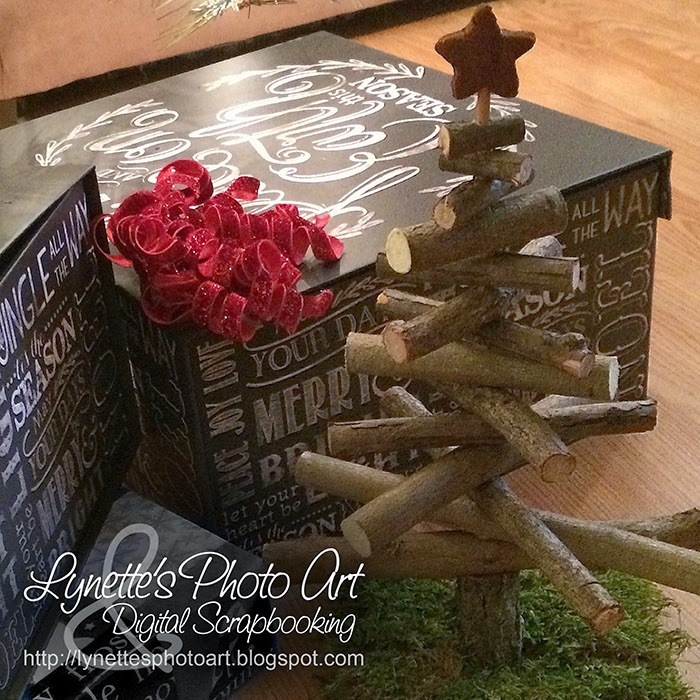 I think we'll all do Christmas pictures with this and it looks like fun to me! Ho, ho, ho! I'm pretty happy with what you see to the left of the Santa set too. I don't have time to make any more twiggy Christmas goodies and I needed to clean it all up. I didn't really want to just toss them out. Then it hit me! Kindling! Isn't that funny? I look at them and see home furnishings and it's thinking out of the box for me to see kindling! Most people just see kindling! I gathered them all up, broken to proper size to use as kindling and wrapped paper bags around the bundles with a strip of black duck tape around the center to hold them and make handles. I know at least one daughter will love this! Waste not want not! "Oh the fire is so delightful..."
Thanks for dropping by! Merry Christmas! I think this will be my last twig project this Christmas. These are snowflakes and stars I made. So many things now exist just from pruning the yard! God fills this life with opportunities for all kinds of wonderful things, but we need to have our eyes open to see them, and then seize the opportunity! This is one of the cute little twig stars and also one of the cinnamon dough stars and paper snowflakes I made. The baby's breath is from my daughter's wedding in October. 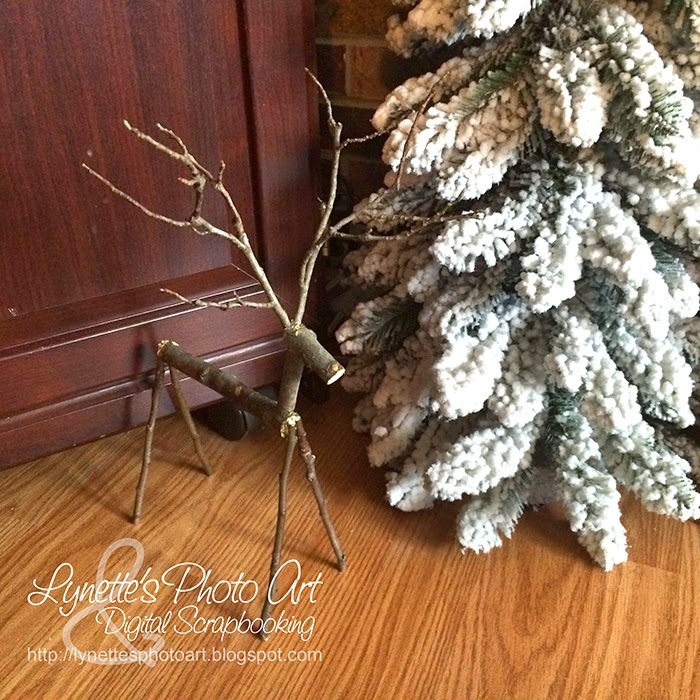 This is a twig snowflake and my much loved chalkboard charger. Make the most of today, it's a gift from God! Merry Christmas and God bless you! 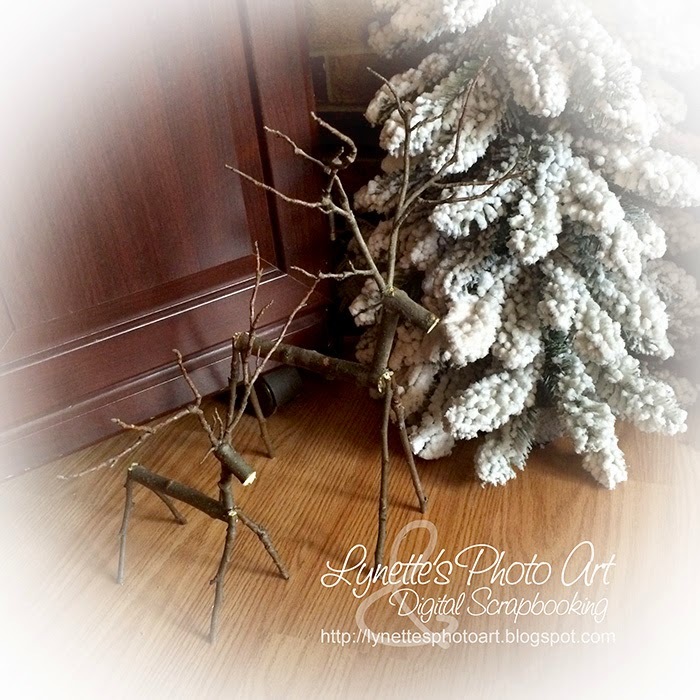 I've been having such fun making gorgeous Christmas decorations out of branches I pruned in the yard. 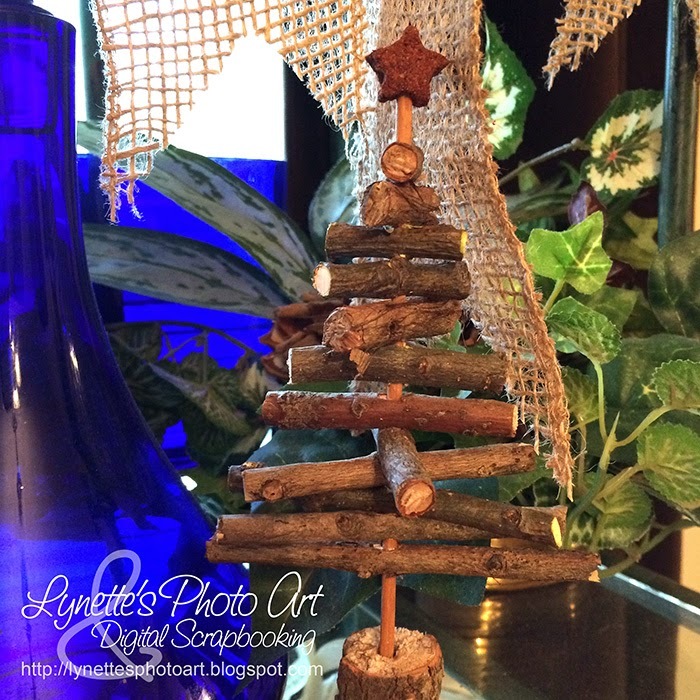 Two posts back I shared a 14" twig tree with a cinnamon star on top on a moss base. This one is an adorable 7" and stands on a stump. I love making things out of what would otherwise be thrown out. Sooo satisfying! 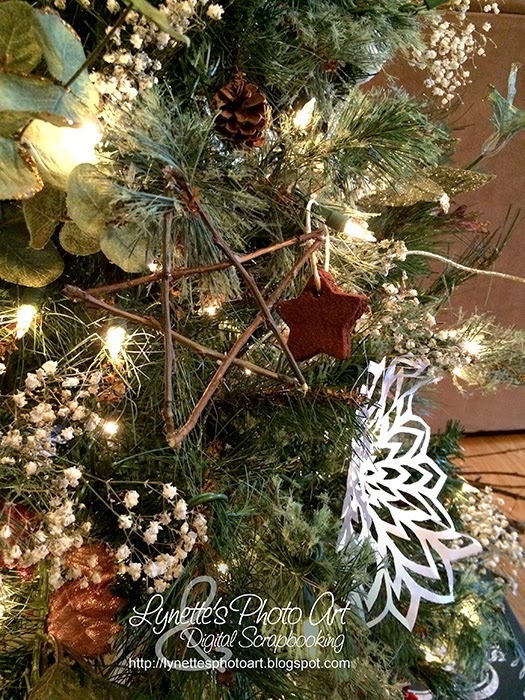 This tree and the cinnamon ornaments were the most fun to make yet as my sister phoned from across country and we both were making Christmas gifts as we talked! It was like so long ago when we would create together. We have had "virtual" tea together this way too. It is amazing how close it feels even with just voices! Maybe there's someone far away you'd like to have tea with this holiday season? You HAVE to try these! They are so gorgeous and FAST, EASY and CHEAP! I used the tutorial I found here. I did change it a little bit though. One napkin makes one blossom and it has four sets of petals. I cut narrow petals out of one napkin and fat petals out of another napkin. Then I used two sets of fat petals for the bottom of the flower and two of the narrow petals for the top of the flower. That made two flowers. It makes a more realistic flower. The other change I made was that instead of putting glue and glitter in the center of the blossom, I got small berries from the yard and glittered them gold, then glued them in the center for the more realistic 3D look. The cocktail napkins I used were only $.97 at Walmart and there are 30 napkins in it = 30 flowers! Can't beat that for affordable! 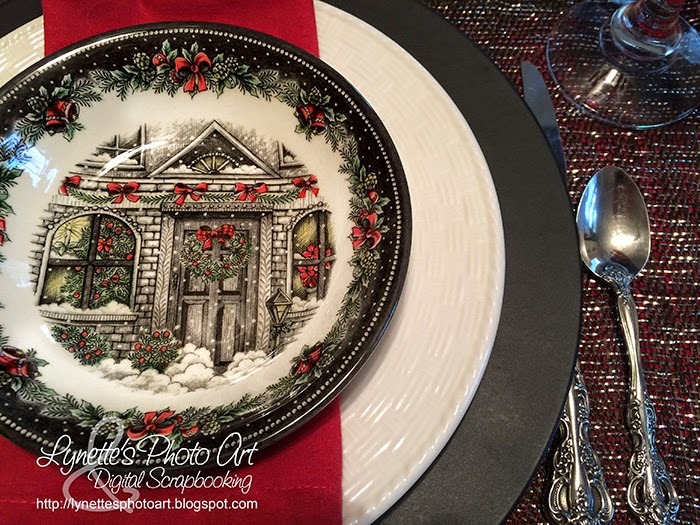 I'm thinking of putting one in each plate for Christmas as I'm using my black chalkboard chargers, white plates and red napkins with red goblets. 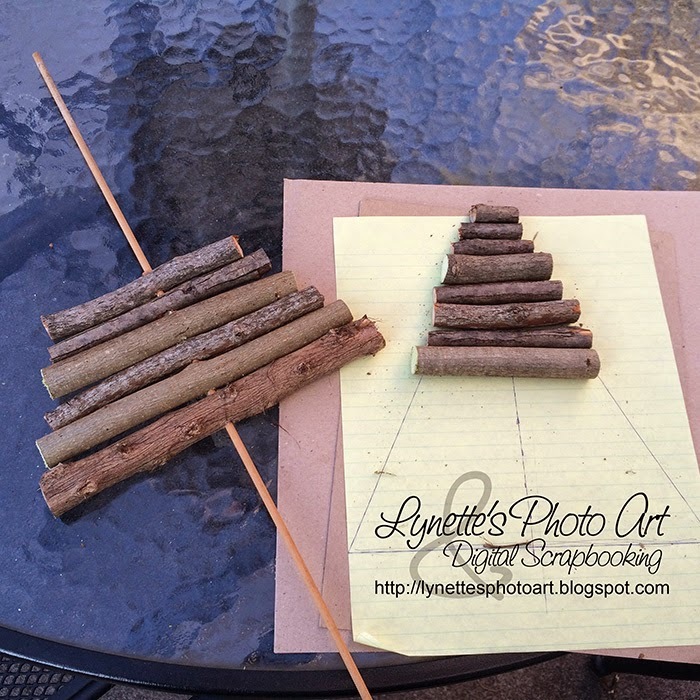 I started by drawing the shape of the tree, marking the center to use as a guide to cut and drill the pieces. I used the center line to mark each piece to drill the holes in the center for the dowel. I made a cinnamon ornament for the star at the top and covered the base with moss. Thanks for dropping by and have a great day! 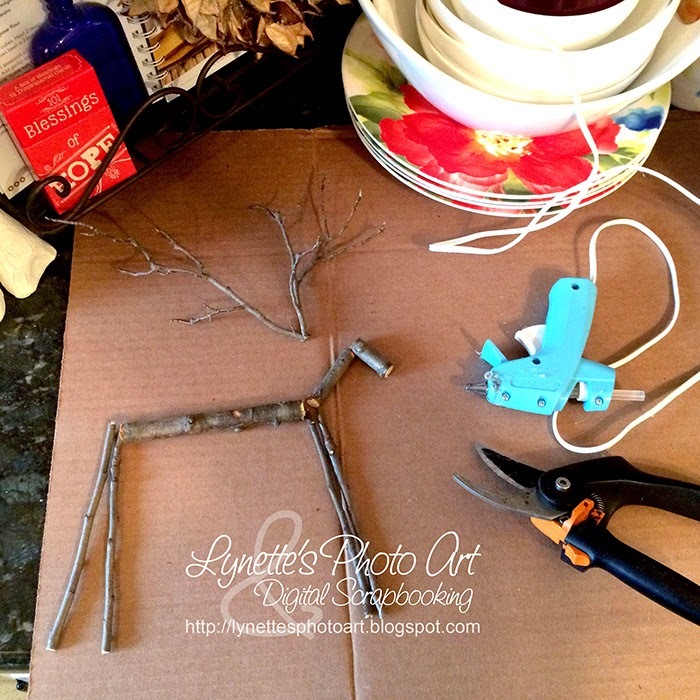 I did some pruning in the yard this week and out popped these adorable Pottery Barn knockoff twig reindeer! These are so easy to make, even though I tried to make it harder. I tried two different saws to do my trimming and was about to pull my hair out, when I noticed what a smooth and beautiful end they had where I'd pruned them from their original homes. ??? What did I use? Pruning shears! Duhhhh!!! Needless to say, after that every cut was fast, easy and beautiful! I just love natural elements and making something wonderful from nothing! I was making this as a gift, but when my husband saw them he went nuts for them and they have to live here. Surely there's more pruning I can do and still have gifts to share. 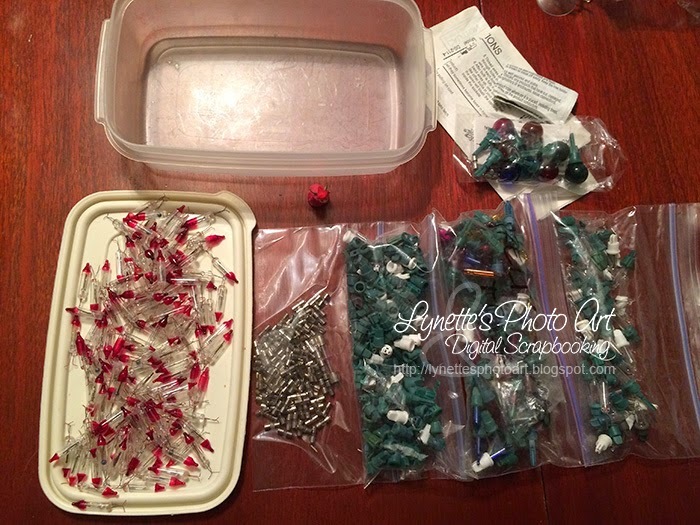 He thinks they would be cute with very tiny (light) Christmas tree ornaments hanging from their antlers....ohhhh, what about those scrapbooking 3D tiny strings of Christmas tree lights? I know I made the heads fatter than the Pottery Barn originals, but I did it deliberately as I like it so much better! Try one yourself! They are a FREE gift from God! Merry Christmas! My daughter used almost entirely baby's breath in different ways at her wedding. When we were leaving, it was going to be thrown out. I knew what she'd paid for it, and I was having a my-daughter-just-got-married-and-drove-away moment too. I stuffed it all in the car and we started our 12 hour drive home. Yep, immediately after the wedding! We even napped at a rest stop on the way. We drove at least 24 hours out of 2 1/2 days, thanks to my husband's not so nice employer. Yes, that stunk. I dried all the baby's breath. I didn't have any plans for it. I saved the bouquets that had been tied with burlap for the ends of the pews just as they were. And there it's been since October 18th! It seemed to need something else to make it "pop". Aha! My gaze fell on all that baby's breath! It was perfect! And all the white helped where the lights are out too. Such an easy time decorating too! I only used a couple of white paper ornaments I made in the past, the artificial flowers/items, and the baby's breath. It looks so gorgeous! And it was quick and will be quick to put away too! Hallelujah! Hope you are having a wonderful Christmastime! God bless you and yours! 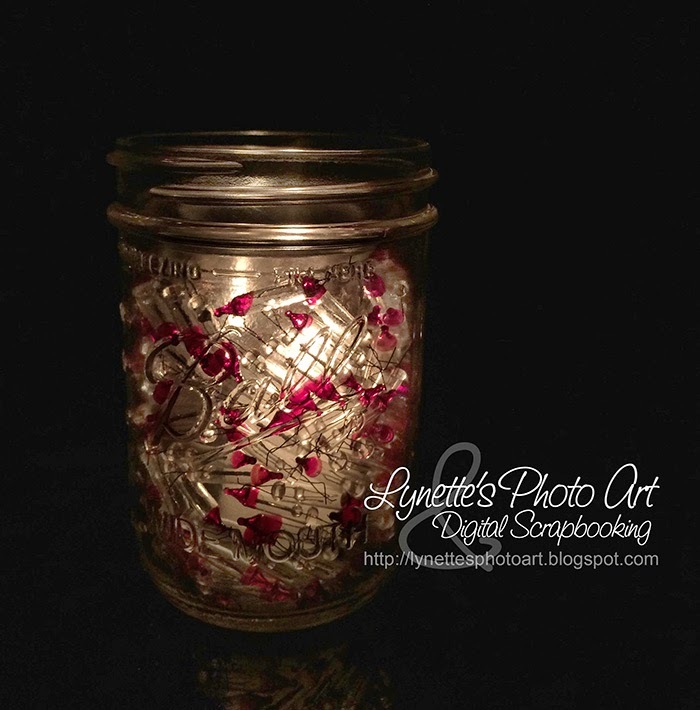 DIY Stunning One Minute Christmas Candle! This is TOO fun and GORGEOUS! The other day my oldest daughter was helping me fix dead lights on my Christmas tree. We were working from a tupperware of spare bulbs I've collected over the years. She remarked on how many flasher bulbs were there. I HATE flashers and wouldn't be able to walk through the room if I used them - they make me dizzy! But there was nothing wrong with them and I had paid money for them, so I had saved them all these years. Waste not, want not! I remembered her comment tonight, so I sorted all the bulbs and fuses. I had 138 flasher bulbs! Isn't that gorgeous? If you follow my Instagram (lynettesphotoart), you can see a very short video of the light flickering through the bulbs. So lovely! It took all of about one minute to make. I save interesting glass jars, so I took a small one (capers) and set it inside a Ball mason jar. I sprinkled the bulbs between the two jars, dropped a votive candle in the center one and voilá! Stunning and FREE! I LOVE repurposing things! FYI, 138 was pretty perfect for this size. I could only have fit a very few more in. Hope you're enjoying these days before Christmas! Thanks for dropping by and sparkle on! Thank you all for stopping by! I have shared before about my work to improve my health and weight this year. Today I thought I'd share my favorite smoothie recipe with you and reviews on two blenders! First I'd like to say we threw HUNDREDS of dollars away two years ago buying everyone Ninja blenders for Christmas. They were ALL junk. Ours never did work properly and died permanently on about use eleven. But, there is good news! When I started working out and dieting in the spring, we bought the NutriBullet from our beloved Sam's Club. Oh my goodness! It is EVERYTHING the Ninja said it was and wasn't and it's cheaper and so much smaller, which is great for counterspace. It works every time. It takes less than one minute normally to make my smoothie. It assembles and disassembles effortlessly and cleanup, sigh, is a dream! I just rinse it with water and wash with the daily dishes. Or, a dot of soap in it, add water and put back on it's base and run for a minute and it's clean! Rinse and let air dry! Soooooo great! When I started the smoothies I googled for recipes. Guess what? You don't need one! I love our Sam's Club. Nearly everything we eat comes from there. For my smoothies, I buy the fresh baby spinach, the bag of fresh mixed veges (carrots, broccoli & cauliflower), and a bag of frozen fruit. I put an enormous handful of raw baby spinach in first, pushing it down to fit as much as possible. Then I break up the broccoli and cauliflower clusters (if they are huge) and add them with carrots. Then I put in just a few pieces of frozen fruit. The difference in flavor is HUGE over straight veges. The frozen fruit also gives it a pleasing texture and temperature. I add some of my protein powder and water. Screw the cap (that contains the NOT SCARY SHARP blade in it), put it on the base, plug in for less than one minute and you are ready! Having had such a nightmare with all the Ninjas, and also having had so many all vege smoothies, I really REALLY appreciate the NutriBullet and being able to add some fruit. It's tasty, healthy and so fast and easy! No excuse not to. I do it every day after the gym. Try it! See you next time and enjoy this Christmastime! Today I'm sharing another awesome song that is really blessing my walk with God. Singing these important truths in such an upbeat and invigorating song really helps to move me into faith that these truths of God are actually true for ME! They are true for you too, if you have repented of your sins, asked Jesus to be your Savior, have given Him your life and have been immersed in water baptism in the name of the Father, the Son and the Holy Spirit. ENJOY THE BLESSINGS HE'S GIVEN US!!! I hope this blessed you as much as it does me! Remember to enjoy this season!